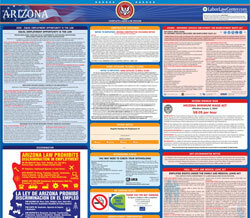 The Arizona Minimum Wage Act is a minimum wage law poster by the Arizona Industrial Commission. This is a mandatory posting for all employers in Arizona, and businesses who fail to comply may be subject to fines or sanctions. This poster must be posted in a conspicuous place where all employees will see it. The poster lists the minimum wage as well exemptions to the minimum wage, minimum wage for those for receive tips and information on who to contact if an employer violates the Arizona Minimum Wage Act. It appears you don't have a PDF plugin for this browser. Please see the link below to download arizona-2019-minimum-wage-poster-english.pdf. wage under section 206(a) of title 29 of the United States Code. the Act . Violations of the Act  may result in penalties.